The Motorola RAZR has made it past the FCC and inside it carried radios tuned to AT&T's frequencies. But before you AT&T customers start getting excited, the frequencies are also used by many Canadian carriers and it is expected that the Motorola RAZR will be heading across the border after it is launched by Verizon. 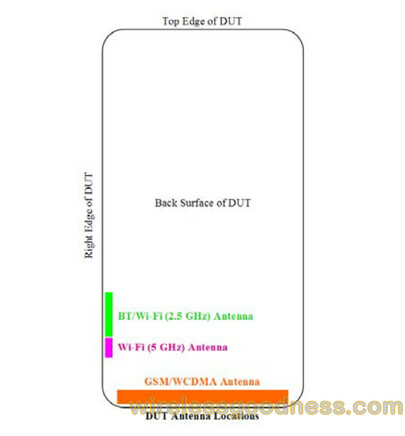 The shared bands are GSM 850/1900 and WCDMA Bands II/V for 3G. No one is ruling out an AT&T variant of the Motorola DROID RAZR as it would make sense for the Schaumberg based company to spread its flagship phone to as many carriers as possible. This is the MO that Samsung has used quite well with its Galaxy line of smartphones. Of course, AT&T has not uttered a word yet and neither has Motorola, but Mobile City Online is offering pre-orders of the imported unlocked GSM version of the phone for $600. Also taking a visit to the FCC was a mystery tablet manufactured by Motorola. It is uncertain if it is the Motorola XOOM 2 or another enhanced version of the original model. What is known is that this tablet has a dual-core 1.2GHz processor, 1GB of RAM and a display with resolution of 1200 x 800. It offers an HDMI out slot and comes in 16GB, 32GB and 64GB models. 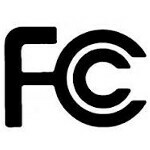 The FCC documents do not have any word on cell connection, only Wi-Fi and Bluetooth. YES PLEASE BRING THIS TO AT&T! Ahh, yeah, my only MOTO phone was the KRZR which was way better than the original RAZR as it allowed an micro SD card. I would be willing to get the phone after some more research. No no no no no...the Razr is the best phone ever made, that's all. (make a little pray after each time you say "Razr"). Well...joke...it was a phone that was pretty unintuitive, pretty hard to use...but the phone you desperately wanted ! I have had one for a time...that was a time manufacturers thinked you wanted to be proud of your phone when you putted it out of your pocket. And that's why I wait to have the current razr in hand, to see if the sensation is the same... Even if I want to compare with the GNexus (but the design bore me a little in photos) and the Nokia WP phones. Jesus, I want this phone so bad, and I would be so happy for this to come to at&t, but at the same time I would be so f*cking mad that I can't afford it. I would probably be a dumb *ss and wait another few months just to get this phone if that happened... Wait, if it does come to at&t, will it run on its new 4g LTE network? or just its hspa+? So glad that this phone won't be a Verizon exclusive. I love seeing another elite phone hopefully sweeping across all the carriers. Especially since this is a "RAZR". Brings back the good ol' days. That looks utterly bogus, why on earth would it be called Droid Razr for At&t unlocked? 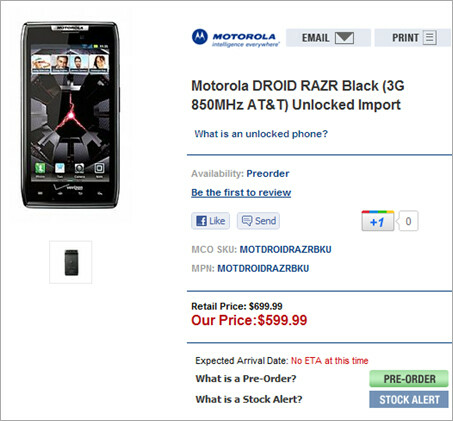 I smell crap mock up, Droid is trademarked for use by Verizon so this would be called the Razr but not Droid Razr. This is most likely going to canadian telecoms like Rogers, besides the original Droid, the X all showed up elsewhere in the world and on smaller networks. Might not see such a high profile phone going to a major competitor, seems like Motorola makes sure that any phone that gets branded Droid by Verizon is not released on a major US network. George Lucas owns the 'DROID' name and Verizon has a deal in place to be the sole user of the name. It is probably a website typo...all that is important is that it has the AT&T band/s. Still no confirmed date for RAZR availability in the U.S. Not even a confirmed date for pre-orders.... F*ck! October 27 is 3 days away and not a peep from VZW.... Double F*CK! My guess is that is launch date for online pre-orders. Settle down there, dude. That's 3 days they still have to announce a release date. Past that the phone is clearly cancelled and you'll have to live with a Droid X for the rest of your life. I hope they unlock the bootloader for this AT&T version!